From quad throw jumps and twists to triple-triple side-by-side jump combinations, the top pairs teams are pushing the technical envelope this season. That trend will continue at this year’s Grand Prix Final with five of the seven pairs attempting planned quad elements in their free skates and a sixth planning a side-by-side triple-triple jump combination. The pairs will kick off the Final in Barcelona, Spain, on Thursday. Typically, the top six ranked teams qualify for the competition, however this year, the seventh ranked pair qualified if they competed at Trophee Eric Bompard (TEB). The International Skating Union (ISU) extended that provision after the event was canceled following the short program amid the terrorist attacks in Paris. Many fans hoped for a head-to-head between reigning Olympic gold medalists Tatiana Volosozhar and Maxim Trankov and World champions Meagan Duhamel and Eric Radford of Canada but that prospect ended when the Russian pair withdrew from their second event, NHK Trophy. The Canadians, however, will still face stiff competition from Russian pairs Ksenia Stolbova and Fedor Klimov and Yuko Kavaguti and Alexander Smirnov: The point spread between the three pairs’ season’s best scores is just a little over a point. Duhamel, who turns 30 on Tuesday, along with 30-year-old partner Radford, won both their Grand Prix events at Skate Canada (SC) and NHK Trophy. When their powerful skating and difficult technical elements come together, it’s easy to see why they are a top pair. At Skate Canada, they wowed the audience with a well-performed free skate to Adele’s “Hometown Glory” that included clean side-by-side triple Lutzes and a throw quad Salchow. The four-time Canadian champs would later struggle with the same program at NHK Trophy, which was marred with errors—including on their usual solid jumps. They won the competition in spite of that performance, but know fully well they will not have the same luxury to make those same mistakes at the Final. Reigning European champions Kavaguti, 34, and Smirnov, 31, wowed audiences last season with a riveting free skate to Tchaikovsky’s “Manfred Symphony” that included a throw quad Salchow. The team brought back the free skate this season with a new element: a throw quad loop. During the free skate at Cup of China (COC), Kavaguti landed and rotated both jumps (albeit with a messy landing on the loop), leading to a surprise win over hometown favorites Weijing Sui and Cong Han. However, the risk did not pay off at Rostelecom Cup (RC) as mistakes on both throws left them in second place behind Stolbova and Klimov. Olympic silver medalists Stolbova, 23, and Klimov, 25, had a rough showing at Skate America (SA). Costly mistakes, including a fall on an attempted throw triple Lutz, led to a surprising fifth place finish after the short program. After a successful landing of a new side-by-side triple toe-triple toe-double toe combination during their free skate, the Russians placed second in the long, but were only able to move up to fourth place overall. At Rostelecom Cup, the three-time European medalists rebounded and turned in two strong skates to win their second consecutive gold at this event. This time, they substituted the throw triple Lutz with a throw triple flip in a sassy performance of their short program to “I Put a Spell on You” performed by Annie Lennox. The two-time Russian champs have yet to attempt any quad elements, but when they skate clean, their big skating and speed will push them up the rankings. U.S. champions Alexa Scimeca, 24 and Chris Knierim, 28, make their first trip to the Final, a bonus for the pair whose goal was just to medal at their Grand Prix events. They are the first U.S. pair to qualify for the Grand Prix Final since Keauna McLaughlin and Rockne Brubaker did so in 2008. Big elements have helped them place well in their two events. Their triple twist is one of the best in this field, and their quad twist in the free skate is just as effortless as the triple. The pair’s powerful short program to Metallica’s “The Memory Remains” has been consistent—they placed first after that segment at Skate America, an unusual position for a U.S. pairs team. However, this team has been more mistake-prone in their free skate, even missing their reliable twist at NHK Trophy. They have temporarily shelved one new element in that program, a side-by-side triple toe-triple toe sequence (they plan to do a triple toe-double toe sequence instead), in hopes of improving the program’s execution. While a medal here is unlikely, two strong and clean programs would be considered progress toward their goal to be the best in the world. Meanwhile, Xiaoyu Yu, 19, and Yang Jin, 21, of China will have their first head-to-head matchup with Julianne Seguin and Charlie Bilodeau of Canada since the World Junior Figure Skating Championships last season. Yu and Jin won their second consecutive title, marking the Canadians’ only international loss that season. Yu and Jin’s trip back to Junior Worlds came after a successful Grand Prix debut that included a trip to the Final last year. But forget the sophomore stump: Their consistency has stayed with them this season. A deep field at Cup of China (that included Kavaguti/Smirnov and Weijing Sui/Cong Han) pushed Yu and Jin to bronze, but two strong performances at NHK Trophy, including their free skate to “Humanity & Love” from the “Creation” soundtrack, led to a silver medal and their second trip to the Final. The pair’s subtle and elegant style has many fans, but they too are going for the quad throw Salchow, although they have not yet landed it in competition. This team could sneak on the podium here if the top teams make mistakes. Canadians Séguin, 19, and Bilodeau, 22, debuted on the Grand Prix series a strong junior season that included the Junior Grand Prix title and a silver at Junior Worlds. They continued to impress in their Grand Prix debut, earning bronze at Skate America and placing third in a deep field after the short program at Trophee Eric Bompard before the event was cancelled. This rookie pair qualified as the 7th ranked pair in the Grand Prix series as they were at the event in France, but are now the sixth ranked pair as world silver medalists Sui and Han withdrew due to injury. Like Yu and Jin, Seguin and Bilodeau offer consistency, and Séguin’s cat-like reflexes has helped her land jumps under the toughest conditions. The pair is not attempting any quad elements and their component scores are the lowest in the field, so it is unlikely they will podium. Nevertheless, their appearance in Barcelona will cement their status as a top Canadian pairs team. Rounding out the field is China’s Cheng Peng, 18 and Hao Zhang, 31, who make their third appearance in the Final. They were originally alternates, but after Sui and Han’s withdrawal, they received the seventh berth to the Final as they competed at Trophee Eric Bompard. Peng and Zhang finished a surprising fourth place during the short program at Trophee Eric Bompard after Peng fell on a side-by-side triple toe loop. The team got on the podium at Rostelecom Cup, winning bronze, but it’s clear that Peng and Zhang are far from their best. Despite this, the pair has two well-choreographed programs that have garnered high program components. A solid free skate to Georges Bizet’s “Les Pecheurs de Perles,” which includes both a quad twist and a throw quad Salchow, could help them get on the podium. 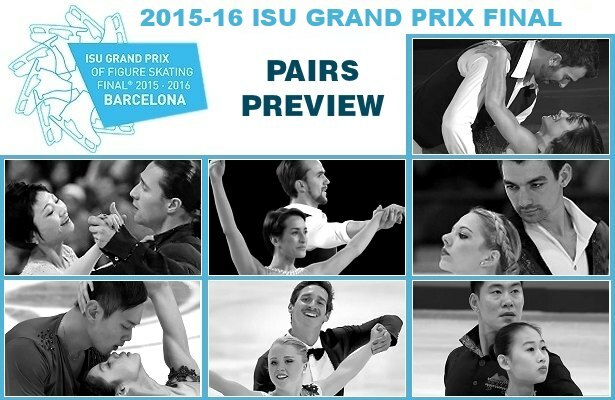 What’s your take on the Pairs qualifiers for the Grand Prix Final? Discuss here!